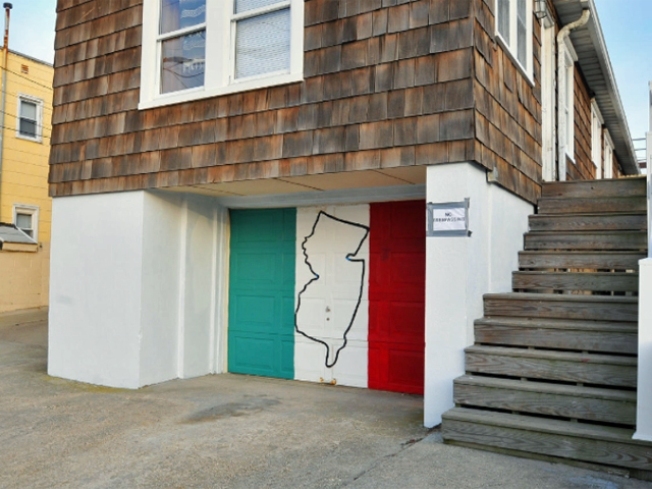 The house made famous by MTV's "Jersey Shore", seen here in 2010, survived Hurricane Sandy. Seaside Heights, N.J. is reeling from flooding and wind damage caused by Hurricane Sandy. But by some strike of luck, the Jersey Shore house--"smush room" and all--survived Sandy unharmed, an on-the-ground reporter for the Newark Star-Ledger tells E! News. "Seaside Heights suffered bad from the hurricane and my prayers go out to everyone affected! We are all fine here...love you JS," Snooki tweeted Tuesday after the storm. "It's devastating to see our boardwalk and favorite spots ruined," she added to MTV News. JWoww tweeted a picture of the destruction, saying that she was "lost for words right now." She added that, "Bubbas and lucky arcade are no more but the shore store is standing but major damage." She told MTV News she's "thinking about my second family at the Jersey Shore and know that we can rebuild and come back stronger"
"My thoughts and prayers go out to everyone affected by Hurricane Sandy, especially our friends and family in Seaside Heights, N.J., and a huge thank you to all the men and women who have been working around the clock to protect and help everyone, true heroes," said Paul "Pauly D" DelVecchio.